As I write these log entries every week or two, it’s easy to get bogged down in the minutiae of “we headed downwind and went wing and wing” or “I pulled out a fistful of hair and made an improvised tool from a sea shell, some seizing wire, and the remaining half of the boat hook,” but sometimes there’s a weekend that causes me to ponder the long arc of our sailing careers. It started with our old boat, Fortuitous I, which happened to be at our marina for some maintenance. We stopped by to say hello. Not sure where the standing rigging went, but I liked the addition of the mast crutch. I was reminded of the first time I ever saw her on a trailer, and that the first of many “what have we done?” moments involved my assessment that she was gigantic out of the water. Seeing her now, after having spent more time on the 27 and around other boats at our sailing marina, she no longer seemed very big to me. I suppose it’s a matter of perspective. In any context though, she’s still a looker, and I’m glad that her new owners are taking good care of her. We were so green back when we were shopping for Fortuitous I that we had to call in favors from people who we didn’t even know to help us with the most basic aspects of an evaluation. Now that I can usually tell the pointy end from the rear part of a boat, I make every effort to pay down some of that karma, and our next stop on Saturday was to perform an informal boat inspection. 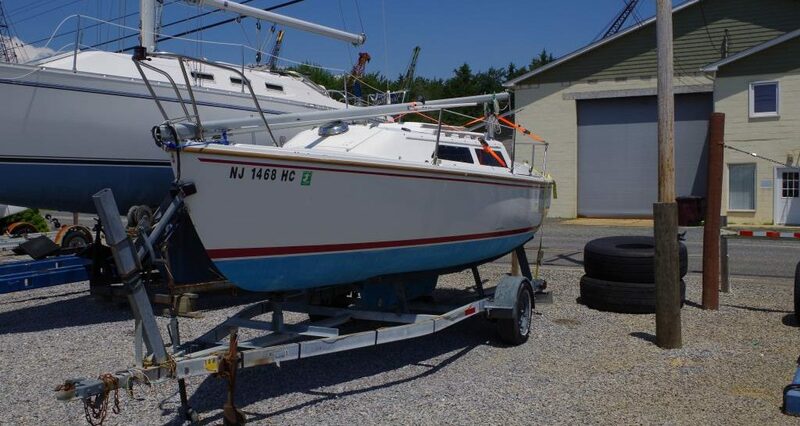 Someone who I know from the sailing forums was looking for a particular sort of boat, and one happened to be for sale at our marina. I did something like this once before, for boat blog magnate bljones of the Dock Six Chronicles, and while it was a bit of an odyssey for a while there, I think that’s mostly turned out for the best. Regardless of any altruistic aspirations, I kind of love doing these inspections because I enjoy poking around boats, seeing how they’re put together, and imaging what I’d want in a next boat. The only bad part about this inspection was the wasps (not the marina clientele—the insects). As soon as I opened the hatch a few weird reddish ones flew out, and I was imagining that in the three or so years that this boat had been on the hard, it was possible that there was a nest in there the size of a garbage bag. I let it air out before heading below, but no more turned up. I mentally scolded the owners for their incorrect ensign, took some photos, and got out of there. When I tried to get off the boat, there were more wasps guarding the boarding ladder. I asked Jen to set up the step ladder to let me escape from somewhere else, but that would have required her to walk directly past them. Fortunately, I think the timbre of her incredulity scared them away, and I quickly disembarked. By the time we’d finished, the sun was high, there wasn’t a trace of cloud cover, and there was uncharacteristically little wind. Although the air temperature wasn’t astronomical, it was the kind of day that left us feeling a little microwaved. In the wake of several high-energy race weekends, we decided to motor over to Governor’s Mansion for a lazy day of anchoring, lounging, and swimming. I was a little nervous about entering the anchorage at Governor’s, with its narrow, unmarked approach. We’ve been there lots of times, but never on our current, fixed-keel Fortuitous. We’d also never done it with a functional depth finder though, which made things a little easier, and it turned out to not be a big deal. Our first attempt at anchoring went fairly smoothly, in our traditional roles with Jen at the bow and me at the helm, but I wasn’t happy with where we ended up—we were only in 5′ of water, which was an uncomfortable depth for both our keel and for keeping my feet off the mucky bottom while swimming. I decided to move us to slightly deeper water, but Jen didn’t want to deal with pulling and resetting the anchor, so we switched it up. It’s comforting to know that even in this stage of our sailing arc, we can still mix it up with a good ol’ fashioned anchoring fight, hearkening back to the heady days of Albuquerque-style anchoring. At least we continue to anchor on the wildly less-popular southern half of the anchorage, with rest of the boats well beyond earshot. Things de-escalated quickly, and we commenced with the lounging and swimming. As the sun dipped to the west, the air cooled and the wind piped up enough that it seemed worth putting the sails up for the return trip. Jen was at the helm for most of it as we tacked back and forth in front of the creek, lingering in the waning daylight before eventually heading in. We’ve come quite a long way since the early days, although we still have a way to go. It seems that there’s always a way to go with sailing, which is one of the things that keeps me coming back. I always chuckle to myself when you bring up the Albuquerque incident. It’s nice seeing your old boats living a good life without you. I was out sailing on Saturday and saw a Catalina 22 that a friend owned sail past. It was great to see it still getting use and the owners looking very happy. I’m trying to imagine anchoring in 5′ of water. I still panic when my boat is in less than 20′ of water. Yeah, at least it's all mud here. If you do rub, it's not that big a deal. I would have preferred 6 or 7', but 20' isn't really an option on Barnegat.